Pianist Michael Brown, violinist Elena Urioste, and cellist Nicholas Canellakis have established themselves as three of the most sought-after young virtuosos on the classical music scene today. Winners, individually, of the Avery Fisher Career Grant, BBC New Generation Artist Scheme, Sphinx and Concert Artists Guild competitions, and Chamber Music Society of Lincoln Center auditions, they have performed in prestigious venues across the United States and Europe, including Carnegie Hall’s Stern Auditorium, Alice Tully Hall at Lincoln Center, the John F. Kennedy Center in Washington, and London’s Wigmore and Royal Festival Halls. 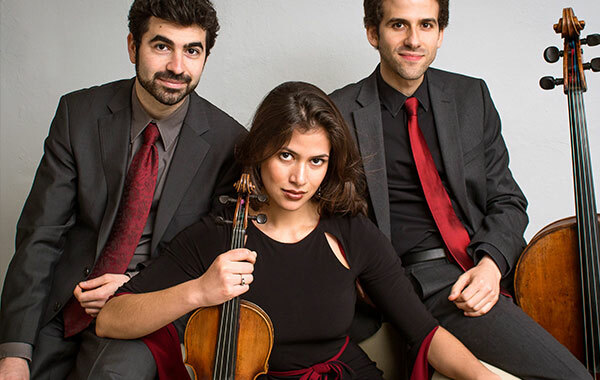 Upcoming engagements for the Brown-Urioste-Canellakis (BUC) Trio in 2016-17 include a performance of Beethovens Triple Concerto with the Albany Symphony Orchestra, and recitals at Lincoln Centers Merkin Hall in New York City and the Norton Building Concert Series in Chicago. Recent season highlights have included a Vancouver Recital Society debut, as well as a Midwestern tour with performances at the Ravinia Festival and a solo appearance with the Heartland Festival Orchestra. Michael Brown has been described by The New York Times as a young piano visionary and one of the leading figures in the current renaissance of performer-composers. He is equally committed as a pianist and composer and his unique artistry is reflected in a creative approach to programming that often interweaves the classics with contemporary works and his own compositions. Elena Urioste, recently selected as a BBC New Generation Artist and featured on the cover of Symphony magazine, has been hailed by critics and audiences alike for her lush tone, the nuanced lyricism of her playing, and her commanding stage presence. Since first appearing with the Philadelphia Orchestra at age thirteen, she has given acclaimed performances with major orchestras throughout the United States.